I created Poor Old Baseball Cards for exactly this type of card. This Wally Pipp Canadian issue has plenty of problems. If you look closely, you will be able to see that this card has been torn twice. The paper is so thin that the card is barely holding together. Also, take a look at the spelling of the name: Wallie? But how many cards of Wally Pipp are out there? And if you can find one, how much is it going to cost? Because this card is a poor old baseball card it cost me $10.50. A bargain in my book. And by the way, next time I watch, "Pride of the Yankees," I'll have my Wally Pipp baseball card sitting next to me. And I'll wonder if baseball would have been different if this Yankee first baseman would have played that day, instead of that other first baseman? Anyone ever heard of Lou Gehrig? This card shows why I enjoy the T206 set so much. Sure it's in pretty bad shape but check out the quality. The deep lime-green background and portrait are nothing less than excellent. Benders eyes seem to almost jump off the card. Not bad for a 100-year-old piece of cardboard. This is my favorite kind of card: The free kind. Here's the deal: I bought a couple of cards on eBay about a month ago and after a few weeks the cards had not arrived. I wasn't really that worried since I had purchased stuff from this seller before. I actually bought two lots and the seller was honest enough to combine shipping and actually sent me money back. When I got the cards in the mail, included were two $1 bills in a small envelope. And when I took a look at the cards, I found this 1951 Bowman between them. I never ordered the card so I e-mailed the seller asking what I should do with the it. She wrote back to keep it since the order took so long to process. Sweet! I scored. Thanks to an honest eBayer. One of the first things I did after getting the card was read its back. And I wasn't disappointed. It seems that Jones' nickname was "Available." While in the minors, Jones' pitching coach asked if anyone was ready to pitch. He replied, "I'm available." 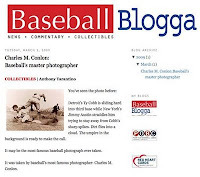 It's a little less structured than Poor Old Baseball Cards and Red Heart Cards, and will include articles on various baseball collectibles not limited to cards. I hope to even have a little commentary and news mixed in. And if you have any suggestions or ideas, please send them my way. Thanks for reading and happy blogging. Enzo Hernandez was the regular shortstop for the San Diego Padres during my early years. But for some reason I really don't actually have any memories of watching him play at old San Diego Stadium. Ozzie Smith I remember. Not so much Enzo Hernandez. A quick look at the back of the card may explain. While Hernandez stole his share of bases, he didn't do much as a hitter. In 1974, his fourth year as the starting shortstop, he batted .232 with 34 RBI and no homers. His batting average and RBI totals were career highs to that point. No wonder I don't remember the guy. This 1975 card of him brings back old memories. The old uniform, the yellow and brown colors, but what's up with the jacket? It looks like the stadium giveaway I got circa 1977. It's making me hot just thinking about it. Time to turn on the air conditioner.